CLAYTON, NC – After a sobering loss to Triad on February 16th, the Clayton RFC 1st XV had their backs against a wall. After a strong start to their season, they were faced with a tough road to reaching the Carolinas D3 playoffs for the second consecutive season. To complicate things, during their nearly month-long break after the Triad loss, the Bootleggers had multiple practices and two scrimmages cancelled due to the weather. All while two pivotal home games were quickly approaching. With a 4-2 record in Carolinas D3 play, the Clayton 1st XV were in a six-team playoff hunt where only four teams advance. The Raleigh Vipers D3 squad were the first roadblock. While the Vipers were out of contention for a playoff spot, they had played a number of close matches against teams in the playoff hunt. 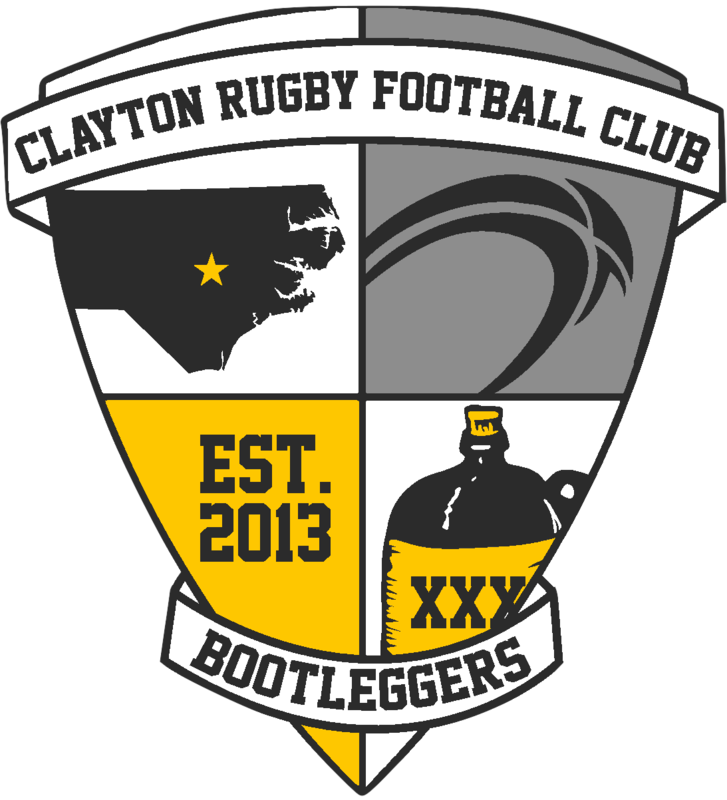 The Bootleggers had never beaten any Raleigh RFC team in the club’s short history and the Vipers weren’t going to make things easy on the home side. The match quickly proved to be a physical affair as both sides exchanged possession and forays into each other’s territory. The Bootleggers were first on the books with a try in the 13th minute from Center Austin Lyons. Raleigh responded back promptly with back to back tries to take a 14-7 lead as Clayton put themselves in penalty trouble. A 30th minute try from Clayton’s Eric Hile and conversion from Ed Dixon knotted the score at 14-14. The Bootleggers then added two more quick scores from Cam Grim and Gareth Davies to push out to a 26-14 lead at the half. The Bootleggers kept up the pressure to start the second half and quickly pushed into Raleigh territory. Eric Davis crossed over to extend the Bootleggers’ lead to 31-14. With the match slipping away, the Vipers stopped the Clayton run with a try in the 48th minute to place the score at 31-19. The remainder of the half belonged to the home side as Clayton rolled on some fresh legs that made an immediate impact. The tries began to roll in for the Bootleggers as they maintained pressure on the Vipers. Trey Eason added two tries, Hile crossed over for his second of the match, and Wes Smith and Simon Potter each touched down as Clayton sealed a 62-19 win over Raleigh. The victory over Raleigh ensured that the Clayton 1st XV made the CGRU playoffs for the second straight year, but the work wasn’t finished. A final match against Cape Fear left to decide who finished in second place and secured a home playoff semifinal. 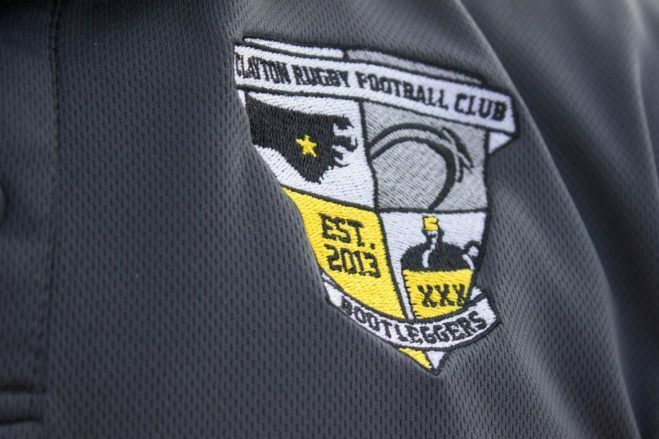 As with the previous week, the Bootleggers faced off against a club that they had not beaten before in club history. The match started off fast and furious as Clayton crossed over in the opening minutes after Eric Davis stole the opening kickoff. Flyhalf Brian Beauregard spotted a gap then offloaded to Gareth Davies who took it in from 22 meters out. Dixon added the conversion for an early 7-0 lead. The home side followed with another try in the 10th minute as wing Cam Grim scored after some nice ball movement from the Clayton backs. Cape Fear opened up their account in the 15th minute with a penalty goal to cut the lead to 12-3. The Bootleggers answered right back in the 16th minute when Davies scored his second try of the match on a weak side attack off of a scrum inside the Cape Fear red zone. A sign of things to come, Cape Fear answered again with a 19th minute converted try as the score sat at 17-10 with a quarter of the match played. Back to back yellow cards to Clayton’s Tim Torres and Cam Grim put the home side under pressure for the remainder of the half, but the defense held strong. The Bootleggers extended their lead just before the half as flanker Eric Davis stiff armed his way in for a 39th minute try that was converted by Dixon to extend the home lead to 24-10 at the break. Cape Fear was first on the scoreboard in the second half with a penalty try in the 42nd minute to place the score at 24-17. Austin Lyons extended the Bootleggers lead in the 44th minute with a try from 30 meters out to extend the lead to 29-17. In the ensuing minutes, both Torres and Grim received their second yellow cards of the match which resulted in both players being sent off for the remainder of the match. With roughly 25 minutes left to play, the Bootleggers were holding onto a small lead and needed to hold that with only 13 men on the pitch. Cape Fear capitalized quickly with a 56th minute converted try to cut the lead to 29-24. That was as close as the match would get as the home side buckled down. Beauregard crossed over for a try in the 60th minute and Dixon added the extras to push the Bootleggers lead out to 36-24. Minutes later Jonathan Diaz broke through for another Clayton try and a 41-24 lead. Cape Fear added a converted try in the 64th minute to cut the lead to 41-31, but the rest of the match belonged to the home side. Lyons added his second try of the match and Davies scored his third try to put an exclamation point on a 53-31 victory. The win clinched a home playoff match for the first time in club history. Clayton gets a return visit from Cape Fear in the semifinals on April 13th. The victory gives the Clayton 1st XV a 9-3 overall record (6-2 in CGRU D3 play) on the season.